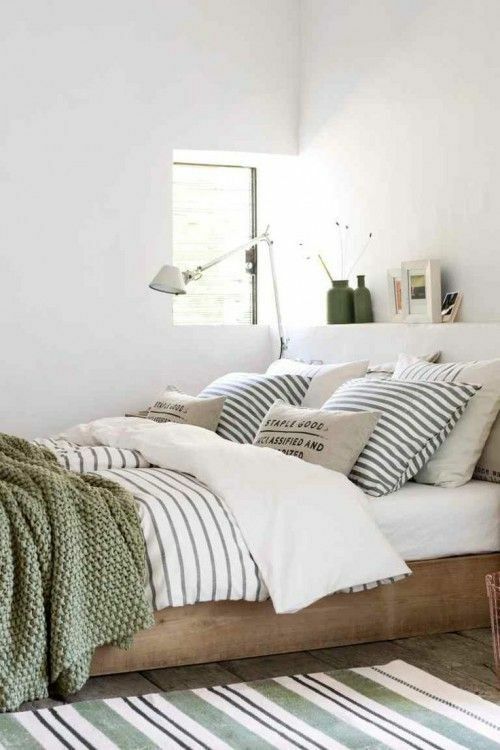 The inspiration for this blanket comes from a beautiful rug that I saw from H & M Home a while ago. I loved the colors and thought it would be a fresh look for a baby boy room (or for a Christmas baby :). It took me a while to find a color of green that I liked, until one day I was browsing the Yarnspirations website and saw this beautiful Woodland Heather yarn. I wanted to try to get as straight of lines as I could, so I used the regular Herringbone Stitch, which is basically double crochet with a slight variation. When I finished the blanket I added a front post/back post double crochet ribbed border. When my mom and I have done this border in the past we usually work it back and forth one side at a time, but this time my mom gave me the idea to experiment working it in the round by working three stitches into each of the corners (I’ll explain more how this is done below). I really liked working around the blanket instead of doing one side at a time and I really like how the corners turned out! I think going around helped to keep the ribbing a little bit straighter and not tug so much at the corners. Chain 95 (or any number). In the 3rd chain from the hook, begin the Herringbone Stitch: yarn over (YO) and insert your hook into the stitch. YO and pull back through the stitch AND the next loop on the hook. YO and pull through ONE loop on the hook, YO, pull through remaining two loops on the hook. When you reach the end of the row, chain 2 and turn. In the new row, I counted the chain 2 as my first stitch, so I started crocheting into the second space of the row below. (Or if that’s confusing, another way to say it is that I went into the 4th chain from the hook). Continue working the herringbone stitch for the rest of the blanket, always chaining 2 at the end of each row. When you reach your desired length and finish the blanket, weave in all your ends with a tapestry needle. For this border I made a ribbed stitch look on each side of the blanket, working around the blanket five times. 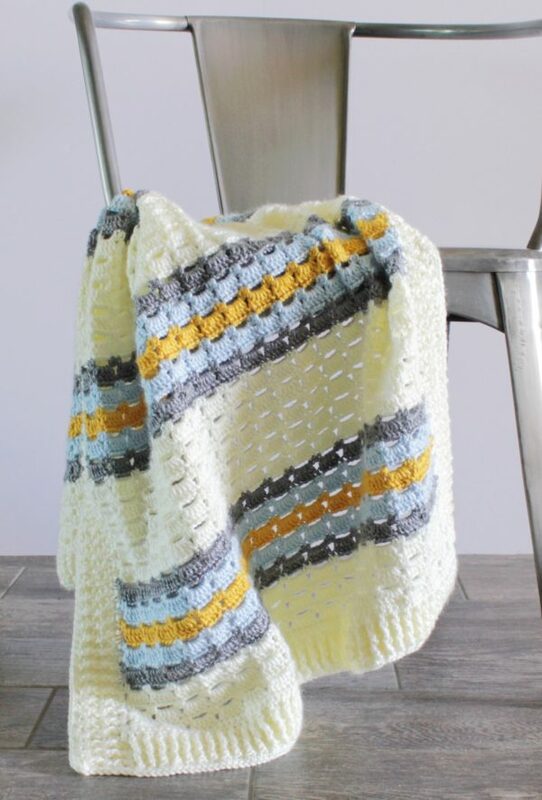 I’ll explain how to do this first, and then you can watch a short video clip that shows how to work front post and back post double crochet. Row 1: Pull up a loop in any corner and chain 3. DC around the entire blanket, work 3 DCs into each corner stitch. 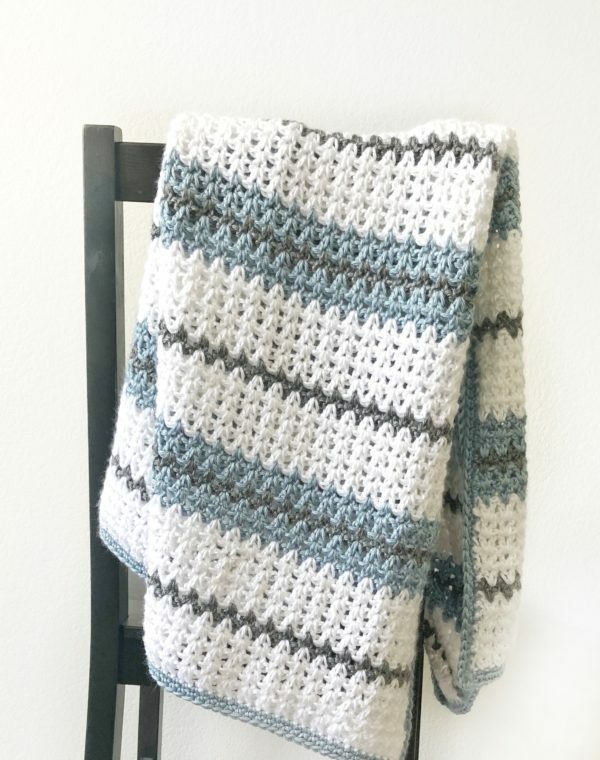 When you get to the corners of this row, you will want to continue the pattern of alternating front and back post double crochet, but you will work three stitches around the corner post. So, for example, if you get to the corner post and you are supposed to work a front post DC, then work a front post DC, a back post DC, and a front post DC all around that corner post. Then in the next stitch you would continue the alternating pattern, working the opposite of whichever stitch you just used (in this example, you would work a back post DC). I hope that is not too confusing! 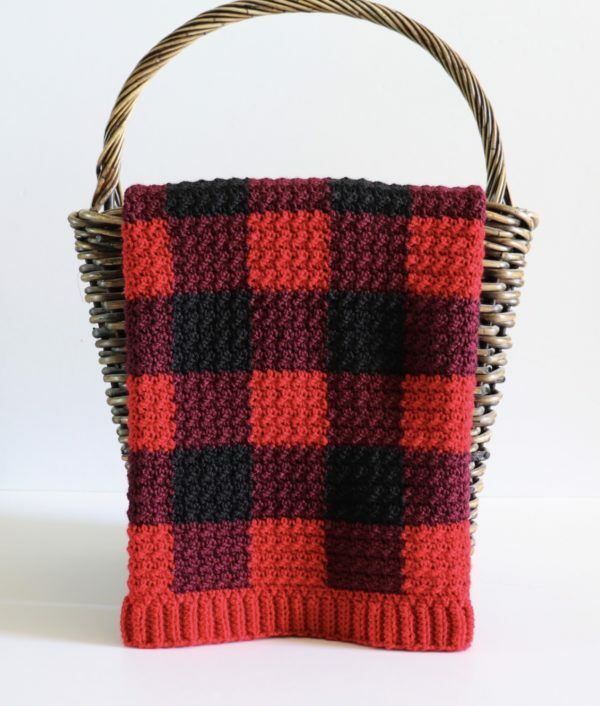 Just remember that you are always alternating front and back post double crochet around the whole blanket, you just happen to be working three of those stitches around the same post when you are working the corners. Row 6: When I finished my fifth row, I worked one round of SC around the entire blanket to even out the tops of the stitches. I worked 3 SCs into the top of each corner stitch and when I reached the corner I started with, I slip stitched into the first stitch and tied off. 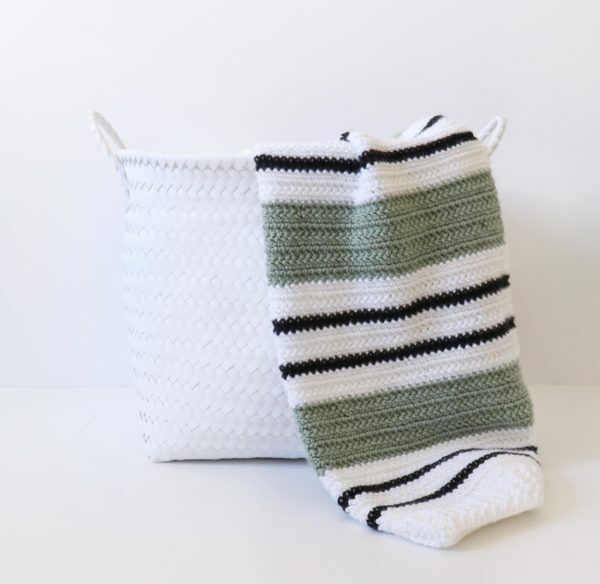 Thank you so much for coming to read this pattern, and best of luck with your project! 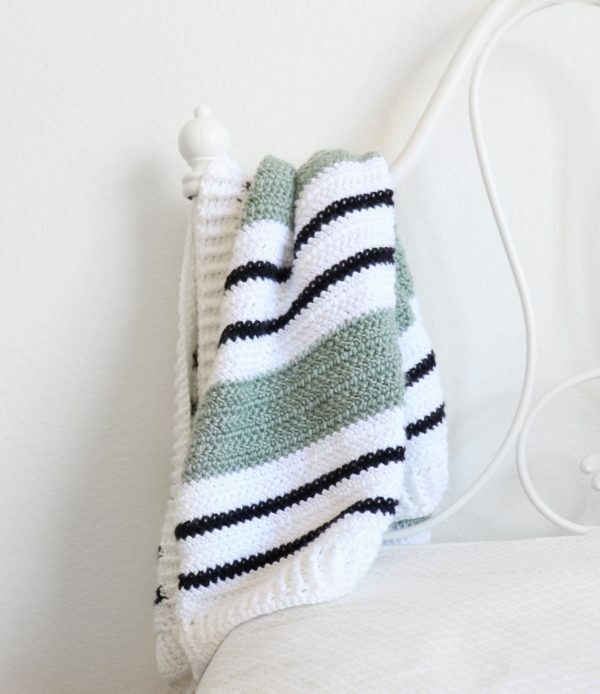 If you are looking for more ideas for crocheted baby boy blankets, here are some other blankets you might enjoy!